Could anyone tell me what's wrong? It could be that the user identity is outdated, especially if you've tried starting a stopped app pool and the next request again fails. In IIS, go to the Application Pools under the Server, then find the correct Application Pool for your web site, and click on it. On the Advanced Settings menu to the right, select Identity and change it and enter new user and password. Click on your Application Pool again, and select Recycle to restart it. You can also try looking at the error message in Event Viewer, under Windows Logs, Application, Details tab. In my case the problem was the DefaultAppPool. I changed the "Load User Profile" to false and now it works. However, I don't know if there are side effects to this. Other answers are fine. But in my case, I was working on a Windows box that already was running some old IIS, IISExpress or any other web site. What happened is urls ACLs where reserved somehow in the system. So, you might want to check this. Check your application's respective Application Framework Pool - it could be stopped. If it is, start it and check again. If you're still experiencing issues you can also check out Event Viewer to find the cause of that error in order to troubleshoot more. In my case, the application pool had stopped. Starting it fixed the problem. My website is hosted on Arvixe. The error problem probably occurred because I have membership based application and something bad happened when I was upload files. If App pool is running under some user identity then go to the advance settings of update username password again, it worked for me. The worker process for application pool 'APP_POOL_NAME' encountered an error 'Cannot read configuration file ' trying to read configuration data from file '\?\', line number '0'. The data field contains the error code. ... you may experiencing a bug that was apparently introduced in the Windows 10 Fall Creators Update and/or .Net Framework v4.7.1. It can be resolved via the following workaround steps, which are from this answer to the related question Cannot read configuration file ' trying to read configuration data from file '\\?\<EMPTY>', line number '0'. Delete the directory (or virtual directory) with the same name as your app pool. Recycle/Start your app pool again. I have reported this bug to Microsoft by creating the following issue on the dotnet GitHub repo: After installing 4.7.1, IIS AppPool stops with "Cannot read configuration file". Microsoft responded that this is a known issue with the Windows setup process for the Fall Creators Update and was documented in KB 4050891, Web applications return HTTP Error 503 and WAS event 5189 on Windows 10 Version 1709 (Fall Creators Update). That article provides the following workaround procedure, which is similar to the one above. However, note that it will recycle all app pools regardless of whether they are affected by the issue. Start by looking in Event Viewer, either under the System or the Application log. In my case the problem was that no worker process could be started for the App Pool because its configuration file couldn't be read - I had included an extra '.' at the end of its name. I ran into the same issue, but it was an issue with the actual site settings in IIS. The fix was to add in http and select OK. The site was then functional again. In my case, I created a new App Pool, and just forgot to start it. It is possible that your domain requires the account used for running the AppPool to have batch logon rights. In which case you will see this same error message. The way you can tell if that is the case, is by looking at the System events in the Event Viewer. There should be an event saying that the account being used with the App Pool has either 'the wrong password or does not have batch logon rights'. This is why developers quite often use IIS Express on their development machine, since it by passes the batch logon rights issue. Check Event Viewer - Windows - Application. If there is a red Error line made from IIS-W3SVC-WP and the message is like The Module DLL C:\Windows\system32\inetsrv\rewrite.dll failed to load. The data is the error. then you are missing some Windows Setup features. In Windows Server 2012 go to Server Manager, Add Roles and Features, Web Server (IIS) and add the matching feature. Usually, most of the Application Development section is installed. Here is a complete list of IIS features and their associated DLL to help in diagnosis. After going through a few iterations of that I ended on the error message above regarding "rewrite.dll". This led to a direct download and install of Microsoft URL Rewrite tool. Finally all websites came to life. If you have IIS URL Rewriting installed it could be to do with that. I suffered issues after a Windows 10 Update. This StackOverflow post helped me. Go to Windows Control Panel > Programs and Features > IIS URL Rewrite Module 2 > Repair. I followed Solve HTTP Error 503 link above. In my case my application pool was stopping every time when I right click on my svc file and choose "Browse". I am using Windows Server 2008 R2. In my IIS manager application pool, I right-clicked on the application pool which I am interested in and clicked Advanced Settings. This opens up Advanced Settings popup. 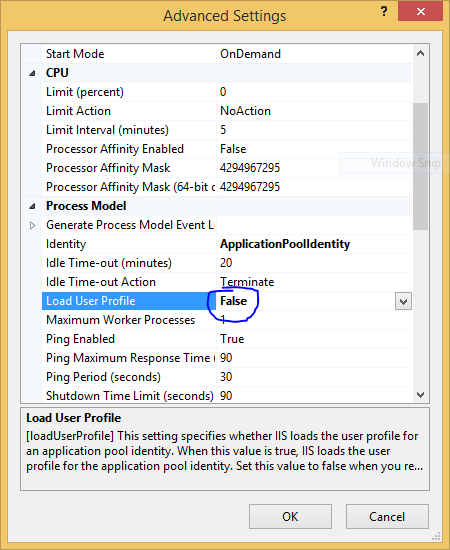 In that under Process Model section click Identity and clicked Set button in my Application Pool Identity popup. This will open Set credentials popup where I gave Username, password, and confirm password and clicked OK.
Now when I right click on my svc file it opens up in IE browser. Or if none of the current solutions work, look in your website's directory for a file called app_offline.htm. That basically tells IIS that your site is unavailable and to show this page instead. To fix it, either delete it or rename it to app_offline.htm.bak. In my case, I added it while showing a colleague how to use that to prevent traffic to the site temporarily and then forgot that I did that on my box. Sigh. For my case, My Default Application Pool was offline, to troubleshoot the problem, I checked the IIS logs located in C:\Windows\System32\LogFile\HTTPERR Scroll down to the most recent error logs, this will show you problems with IIS if any My Error was "503 1 AppOffline DefaultPool"
After some try and error I found out, that the app pool was configured to use my domain account as identity and I remembered that I changed the password of my domain account shorty before. Resetting the application pool’s identity (using my new password) fixed the problem and the app pool could be restarted without any problems. In my case, the problem was that another application was using the port that I had bound to my web site. I had the same error today. The issue was that I recently changed the domain password, so I had to update it in each Application Pool, in Advanced Settings > Process Model > Identity credentials. Our server ran out of disk space on Sunday afternoon which led to an application suddenly failing and returning HTTP error 502. The logs were empty so it had to be something that was occurring before IIS even did anything. A swift look at the event viewer(WIN+R > eventvwr) exposed the issue. It's a good idea to filter out the output of the System and Application windows to WAS since it can get pretty verbose in there. The application depended on another one which was disabled. Therefore keep in mind an application can go down indirectly if one of it's dependent processes has gone down. We simply re-enabled the .NET application pool and our other application started running normally again. This happened to me on a server on our intranet. After browsing through blog posts and Windows logs, it turned out that a few days before Christmas 2015 (related to a Windows Update?) my web site application pool wanted to create a config file in folder c:\inetpub\temp\appPools, but access to this folder was restricted. This caused the application pool to be disabled. After adding Full control to Everyone on this temp folder, I restarted the Windows Process Activation Service and everything went online again. This could also happen if any recent installs or updates happened with .NET framework and/or ASP.NET. If you are unsure of what happened recently and if all your apps use ASP.NET version 4, you can try reset them by running the following commands in command prompt in administrator mode. This makes sure to install or reinstall ASP.NET 4 and updates existing applications to use ASP.NET 4 version of the app pool. It updates both IIS Classic and Integrated mode handlers and script mappings in the IIS metabase. It also recreates ASP.NET v4.0 and ASP.NET v4.0 Classic app pools, and sets .NET framework 4 to DefaultAppPool and Classic .NET app pools. Same thing with IIS Express 10.0 after upgrading Windows 7 to Windows 10. Solution: go to IIS and enable all disabled websites and reinstall ASP.NET Core. The Module DLL C:\Windows\System32\inetsrv\HipIISEngineStub.dll failed to load. The data is the error. Then this workaround on McAfee.com resolved the issue in my case. Open the file applicationHost.config as Administrator for editing in Notepad. After you have finished editing the applicationHost.config file, save the file, then restart the IIS server using iisreset or by restarting the system. Also check the address bar and make sure the page is in the right location. This error can be returned instead of the 404 (Page not found). In my case, it was a bad link on the page that didn't have a subfolder included. This might be because of number of connections to the database. I had such a situation and so, wrote a de-constructor and killed db open connection and it resolved. Not the answer you're looking for? Browse other questions tagged asp.net iis http-error or ask your own question. HTTP Error 503. The service is unavailable in IIS?